Joni Ernst is a Republican member of the United States Senate representing Iowa. Previous to this she was the Iowa State Senate, she represented District 12, a position to which she was elected in a January 2011 special election. She also served as the Assistant Minority Leader of the Iowa State Senate. After her inauguration as Senator, Ernst was selected by John Boehner (R), the Speaker of the House, to deliver a rebuttal to President Barack Obama after his State of the Union Address. See BallotPedia for career, committees, voting record and other topics. Charles Ernest "Chuck" Grassley (b. September 17, 1933, in New Hartford, IA) is a Republican member of the U.S. Senate from the state of Iowa. Grassley was first elected to the Senate in 1980.He announced in September 2013 that he will seek re-election in 2016. He will face Patty Judge (D) in the general election on November 8, 2016. Iowa’s U.S. Senate race is rated as safely Republican in 2016. The general election will take place on November 8, 2016. He previously was a member of the U.S. House of Representatives from 1975 to 1981 and a member of the Iowa House of Representatives from 1959 to 1974. Send a question or comment. 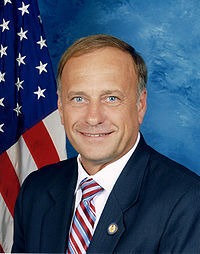 Steven Arnold "Steve" King (b. May 28, 1949, in Storm Lake, IA) is a Republican member of the U.S. House of Representatives representing Iowa's 4th Congressional District. King was first elected to the House from District 5 in 2002. King was born on May 28, 1949, in Storm Lake, IA, and raised in Denison, IA, where he also attended high school. Although he attended Northwest Missouri State University from 1967-1970, he does not have a college degree. Prior to his political career, King worked as a businessman. (born August 4, 1959, in Truro, Iowa) is the 43rd and current Republican Governor of Iowa. Reynolds succeeded Terry E. Branstad, who resigned on May 24, 2017, to take the position of U.S. Ambassador to China. She was first elected as Lieutenant Governor of Iowa on November 2, 2010. Reynolds officially assumed office on January 14, 2011, and won re-election to a second term as lieutenant governor in 2014.Reynolds ran successfully for a second term as lieutenant governor in 2014, re-teaming with 2010 ticket mate, incumbent Governor Terry Branstad (R). Kim Reynolds won the general election on November 4, 2014. Prior to becoming lieutenant governor, Reynolds served as a Republican member of the Iowa State Senate, representing District 48. On November 12, 2010, Reynolds resigned her position as State Senator in order to fulfill her new position as Lieutenant Governor, effective in 2011. A February 2013 article in Governing named Reynolds as one of the top state Republican officials to watch in 2013. Before entering politics, Reynolds worked a wide range of odd jobs, ranging from the private sector position of Pharmacist Assistant to public service positions such as Treasurer of Clarke County and board member for the Iowa Public Employees Retirement System. See BallotPedia for career, stance on economic & social issues, and other topics. Adam Gregg is the 47th and current Lieutenant Governor of Iowa. He was appointed to the position by Gov. Kim Reynolds on May 25, 2017. At the time of the appointment, Gregg was serving as the Iowa Public Defender. Prior to that, Gregg was the Republican nominee for Iowa Attorney General in the 2014 elections. Adam Gregg lost the general election on November 4, 2014.An Iowa native, Gregg attended West Sioux High School and Central College, where he studied political science and history and interned with the U.S. Department of Defense, the U.S. Congress, and the Parliament of the United Kingdom. Gregg went on to attend Drake University School of Law as an Iowa Supreme Court Scholar. Gregg practiced law for a time at the offices of BrownWinick in Des Moines before joining the staff of Gov. Terry E. Branstad. Gregg was appointed Lieutenant Governor of Iowa by Gov. Kim Reynolds on May 25, 2017. Reynolds, the previous Lieutenant Governor, had become Governor the day before following the resignation of Terry E. Branstad to serve as U.S. Ambassador to China. Following a legal opinion by Attorney General Tom Millerstating that Reynolds would not have the ability to appoint her own lieutenant governor, Gregg was appointed in such a way that he will "'operate' the office of lieutenant governor, but not actually 'hold' that office" according to a Des Moines Register report citing Reynolds' Deputy Chief of Staff Tim Albrecht. Although Gregg holds the title and carries out the responsibilities of the office, he is excluded from the line of succession. This means that if Reynolds is unable to carry out the office of governor, the new governor will be Senate leader Jack Whitver. Steven Holt is a Republican member of the Iowa House of Representatives, representing District 18. He was first elected to the chamber in 2014. See BallotPedia for career, committees, sponsored legislation, and other topics. Jason Schultz (b. November 27, 1972) is a Republican member of the Iowa State Senate, representingDistrict 9. He was first elected to the chamber in 2014. He previously served in the Iowa House of Representatives, representing District 18 from 2009 to 2015.